I was at the wonderful Library Center in Springfield, Missouri, perusing their gift shop before settling in to the coffee shop to read for a bit, when I ran across this book. 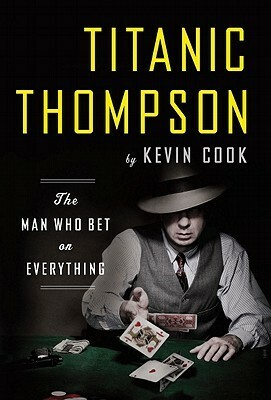 I had taken note of it when it first came out because "Titanic" Thompson was the inspiration for Sky Masterson, a role my brother once played in the musical Guys and Dolls. What I did not know was that he was from the Missouri Ozarks, which makes sense why they would have bought a lot of this book in their library system when it was first published. And since my boyfriend occasionally gambles (in fact, had lost a lot but won it all back and then some just two nights earlier in St. Louis), I thought it would be a perfect book for him. And I thought I'd just take a quick look at it. And I didn't put it down for two hours. My own book never made it out of my purse that day. Just reading the flap copy is eye-poppingly unbelievable. As an example: "He killed five men and married five women, each one a teenager on her wedding day." That's enough to base most books on right there, but no, there's more: "Dominating the links in the pre-PGA Tour years, Thompson may have been the greatest golfer of his time, teeing up with Ben Hogan, Sam Snead, Lee Trevino, and Ray Floyd. He also traded card tricks with Houdini, conned Al Capone, lost a million to Minnesota Fats and then teamed up with Fats and won it all back." Thompson never drank, only killed in order to not be killed himself, and with one exception never placed bets he didn't know he could win. It's bizarre to fathom how this can be true of a professional gambler but he did mark cards, and he was creative at figuring out how to win something things, and a maniacal practicer at others. The one exception was horses. He once bribed and threatened all the jockeys of the other horses in a race, and yet his horse managed to break a leg mid-race. All the other jockeys reined in their horses and refused to cross the finish line, fearing for their lives and their bribes. The horse that finally did win, was rider-less. He really couldn't win at horses. Inveterate gambler, trickster, charmer, and raconteur, Thompson crossed paths with everyone of note in his era, in his trade. Utterly fascinating, this story wouldn't be remotely believable as fiction if you took out half of what he did. A one-of-a-kind and wildly interesting guy, while I'm glad I never crossed paths with Thompson (for even I, a never-better, likely would have been tempted by a few of his seems-like-you-can't-lose bets that were truly can't-wins), I could read about him all day long. And I did. I bought this book at The Library Center. You are right about the flap cover on this one - It pulls me right in!